Izmir was inhabited ago 5000 years or maybe even before, according to recent findings have revealed. 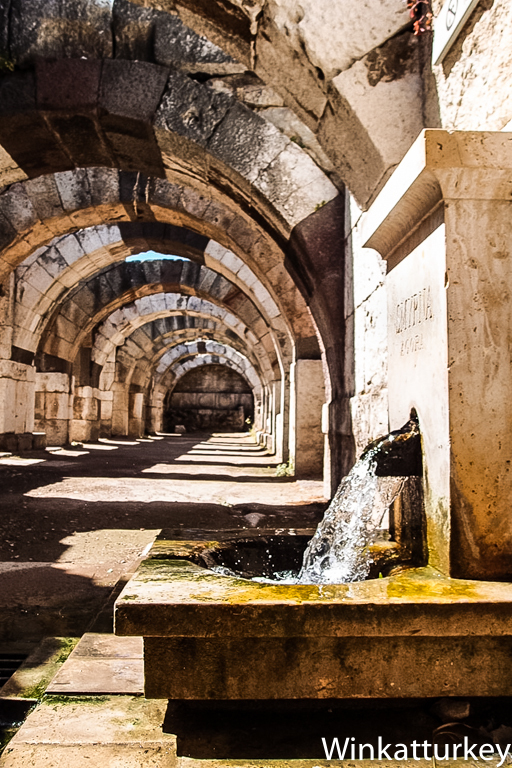 The most important ruins of the ancient era of the city are the open-air museum of the Agora of Smyrna. It is located in the center of Izmir, next to the famous bazaar Kemeraltı bazaar and at the foot of Mount Pagos (Kadifekale). Izmir is also one of the seven cities in the Book of Revelation, which highlights not to receive any reproach and its strength against persecution. It will not take long walk this archaeological site and enjoy the ride through a city refounded by Alexander the Great and was one of the richest in Anatolia for centuries. Not for nothing, is known as the pearl of the Aegean. The entrance to the Agora is in a street perpendicular to the street that goes to Kadifekale and delimiting the Bazar de Kemeralti. When we have a high view of the entire museum west porch to our left, the remains of the basilica before us and the Ottoman cemetery on our right. The agora was a plaza with two commercial areas and a basilica, what we can see today are the remains of the reconstruction made the Emperor Marcus Aurelius after the terrible earthquake of 178 completely destroyed the city. Because of this experience, both the basilica and the arcaded shopping areas were built on a structure resistant to earthquakes arches and now you can go down to visit. Recent excavations have discovered a street that came directly from the agora and the port served as entrance of goods and passengers to the city. Remember that in those days the port where it is found today Karavanserai the Bazar de Kemeralti, By that it only 400 meters separated the harbor agora. A good way to visit the museum, after passing between the two lions guarding the entrance, is addressed to the right to see the Ottoman cemetery, then take a look at the area where the eastern portico of which almost nothing was not preserved and then cross the courtyard and head to the western porch with known line of columns that are the most familiar image of the agora. On our way we pass between numerous remains found in the center of the agora and that once were a temple of Zeus. To the right are the remains of the basilica, where it continues digging. The visit to the area under the arches that supported the porch is a sign of the seriousness and architectural knowledge of Roman engineers. Down there we find paved streets, sources and an effective drainage system that has lasted until today. We also find Greek and Roman inscriptions that commemorate important events such as visits of emperors or celebrations Games. The arches are still under the ruins of the basilica but there are areas where you are currently working and is not accessible If we are doing our visit in the hot summer months of Izmir, this is a place that cost us out. Smyrna was always a place with a large Jewish population, which led to the arrival of many Sephardim from Spain following their expulsion 1492. In Roman times supported the numerous persecutions suffered by Christians in the city and we find advertised in the Book of Revelation. In Scripture, Smyrna appears as a church suffer persecution but will face them through their strong faith, with Filadelphia is the community that provides an example of the seven mentioned. In Smyrna St. Polycarp's martyrdom took place, pattern city, who died in the fire at the theater located about three hundred meters southeast of Agora that there are no remains to be found in an area inhabited. Of course, worth it to find a while on our visit to Izmir to visit the Agora. Although not among the most spectacular ruins of a region rich in archaeological remains, not have to separate us from the sights of the city and we can see the origin of one of the cities that are leading the development of modern Turkey. See map of the Seven Churches of Revelation. Capital located at the entrance of the museum. View west from the center portico Esplanade. View of arches under the basilica. Roman engineers Incredibles. Build on arches to absorb seismic waves is simply great. Good thing they did not think to do it with cushions, because it would have spoiled the Japanese invention. However the impressive size of the agora, suggests the importance of the city at that time.